Palestinians In Jerusalem Struggle To Maintain A Foothold In The City They Call Home : Parallels Israel has reshaped Jerusalem in a way that leaves many Palestinians struggling. About 38 percent of the city's residents are Palestinian. Tens of thousands live behind an Israeli-built barrier. 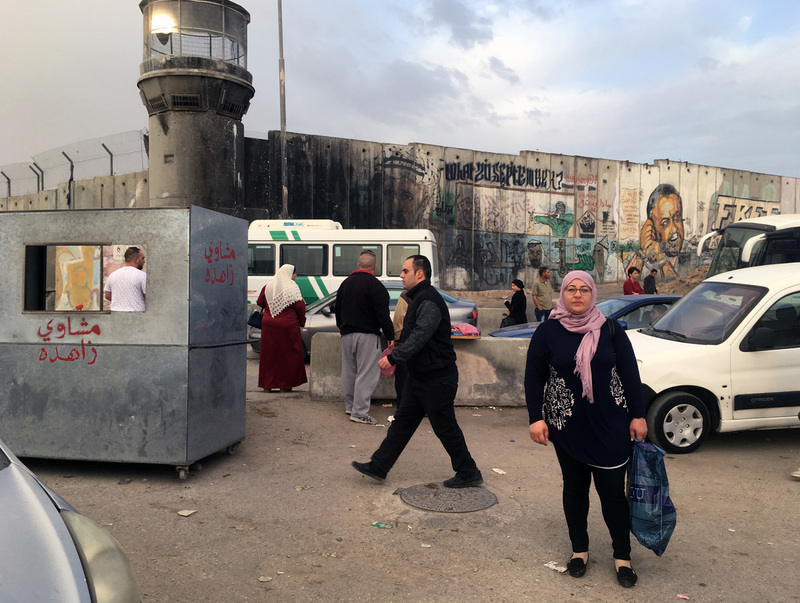 Raja Tamimi must cross the Qalandia checkpoint to commute to her job in Jerusalem's Old City. Since the mid-2000s, according to census figures, tens of thousands of the city's Palestinians live behind a concrete wall that cuts through the city. It's part of the barrier Israel built during a wave of Palestinian attacks in the early 2000s to keep attackers out. 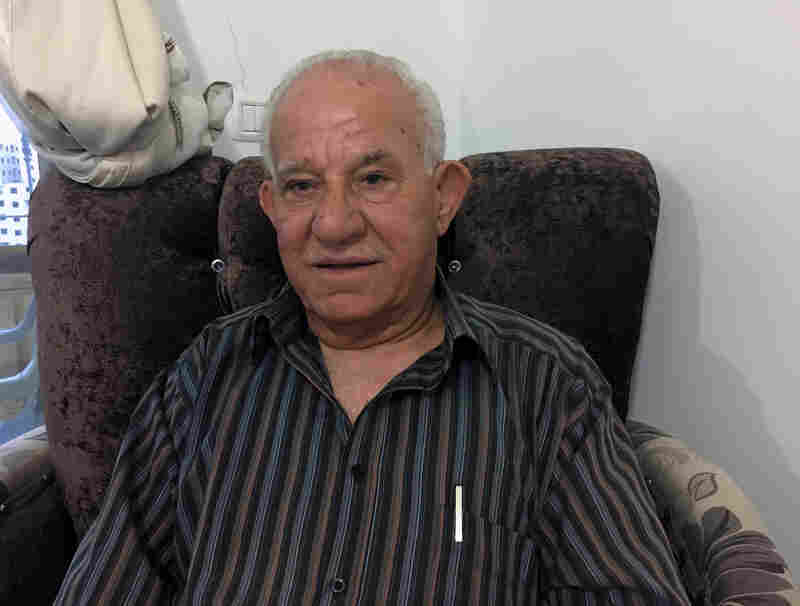 It makes for a complicated commute to work for Palestinians like Raja Tamimi, who works as a guesthouse receptionist in the Old City. First, she boards a shared taxi at 6 a.m. On a recent morning, the driver barreled down the wrong lane, past a line of cars waiting to get through the checkpoint. "It's very dangerous," Tamimi says. "But if he don't do that, he will not reach here." 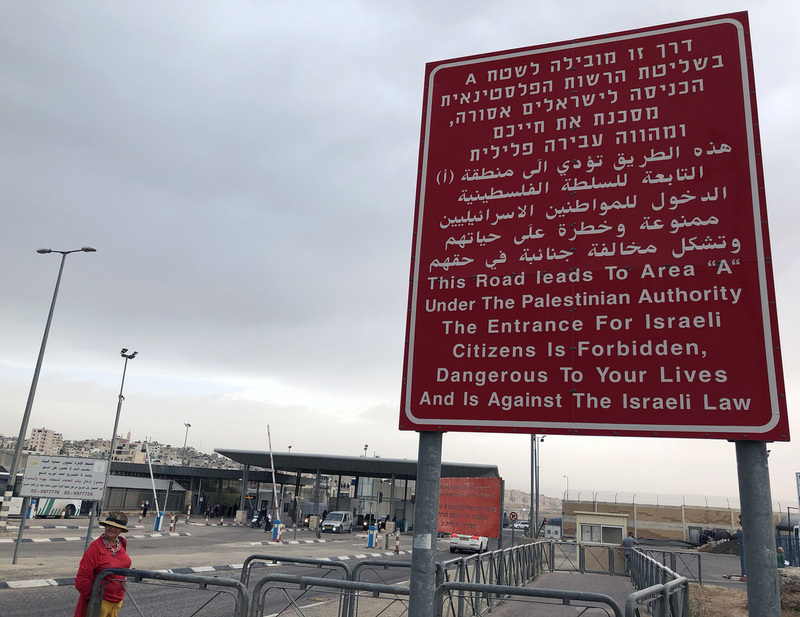 A sign at an Israeli checkpoint warns Israelis not to enter. A Palestinian neighborhood is located behind the checkpoint. "Here" is the Qalandia checkpoint, with military guard towers and a tall concrete wall covered in "Free Palestine" graffiti and murals showing famous Palestinian political and militant figures. Per Israeli rules, the taxi driver is not permitted to drive through the checkpoint. And Tamimi says she's not allowed to take a bus through the checkpoint because she's under 45 years old. 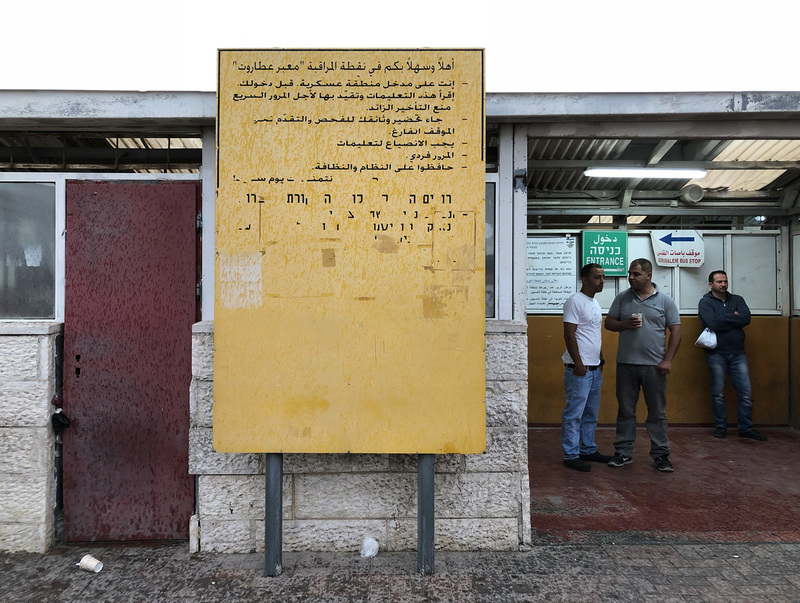 She could walk through the checkpoint, pass through a metal detector and show her ID card to a soldier behind bulletproof glass, but that would take too long with other Palestinian Jerusalem residents crowding the line during morning rush hour. So she flags down a ride from a private driver who's made it to the front of the line and gives her a ride through the checkpoint to work. She said her hour-and-a-half morning commute would take 20 minutes if there were no wall or checkpoint. "It's not fair," Tamimi said. "I have to hurry. It's not easy, it's not normal to go to the checkpoint, see this bad view. It's not good." She didn't always live behind a wall. She used to rent a home that overlooked the Old City, but she wanted to buy a home of her own. Israel provides few building permits that would allow Palestinian neighborhoods in Jerusalem to expand, and housing prices were at a premium. She felt she had few options but to move behind the Israeli barrier to Qufr Aqab, a neglected Jerusalem neighborhood where she could afford to buy a home. "I hate to rent and move from this house to this house – it's not easy and it's not fair. You don't feel safely. You have all the time thinking about the future," Tamimi said. Akram Tamimi, 79, moved to a neighborhood behind the barrier to maintain his Jerusalem residency rights, but calls it "a prison." She has considered applying for Israeli citizenship, which would cement her status as a citizen of Israel rather than the lesser status of resident in the city. It's something many Palestinians scorn as surrendering to an occupier; Israel often rejects applications anyway, sometimes citing security reasons. Her 79-year-old father Akram Tamimi also uprooted to the same neighborhood behind the barrier. "We call it a prison. Not a life," he said. He used to live in a four-story home with a garden on the edge of the city. But in the mid-1990s, the geopolitics of the region changed. His home was deemed to be a part of the West Bank and under partial Palestinian self-rule. If he stayed there, Israel could strip him of his Jerusalem residency rights – and his access to Israeli health insurance and Jerusalem hospitals. "Because of that," he explained, "I came here. Just looking for the future health." He lives behind the Israeli barrier, where Israeli police don't often patrol, where Israeli ambulances don't enter. If he would need to rush to the hospital, a Palestinian ambulance would take him to the checkpoint, where he'd have to be transferred to an Israeli ambulance on the other side. "Many times the sick person died before arriving to the hospital," he said. He has Israeli friends, but they don't visit — a big red sign at the barrier warns Israelis not to enter. This area is not Palestinian-controlled territory. It is still a part of Israeli-controlled Jerusalem. "This is very good to animals. Not to human beings," he said. President Trump has said the final borders of Jerusalem are subject to negotiation, hinting that Palestinians could still establish their hoped-for capital in parts of East Jerusalem. Israeli lawmaker Michael Oren suggests that President Trump's promised peace plan may require Israel to make concessions. Palestinians go through an Israeli checkpoint at the Israeli separation barrier, which cuts through some neighborhoods of East Jerusalem. "Let's discuss it. Do not reject it out of hand. Even if it has aspects difficult to us, including aspects relating to Jerusalem," Oren said. Even without a peace plan, some Israeli lawmakers want Israel to redraw municipal boundaries, to remove Palestinian neighborhoods of East Jerusalem from the city limits, in an effort to decrease the percentage of Palestinians considered part of the city and therefore tip the scales in favor of the city's Jewish majority. What would happen to those Palestinian neighborhoods varies depending on the proposal. Some say they should become a new Israeli municipality — keeping the territory in Israeli hands while not allowing its Palestinian population to outweigh Jerusalem's Jewish population. Others say the neighborhoods should be handed over to Palestinian control and become a Palestinian capital. If Israel does withdraw from Palestinian neighborhoods, like where Raja Tamimi lives — she says she'd move again to make sure she could stay in the city that's her home, and maintain the Israeli residency rights she is guaranteed as a resident of Jerusalem, like national health insurance and access to the Israeli job market. "We want to live in Jerusalem," she says, "because we want the ID. You don't want a good life?"